Types of stairs - Advantages & Disadvantages. Straight stairs are certainly one of the most common types of stairs found in both residential and commercial properties. Straight stairs tend to be the easiest to go up and down or, ascend/descend, as we say in the industry. They are typically the easiest to build however this depends a lot on the level of detail in the design. Straight stairs only need to be connected at the top and the bottom (no intermediate supporting structure is required). They work well with minimalist designed homes due to their inherent simplicity. 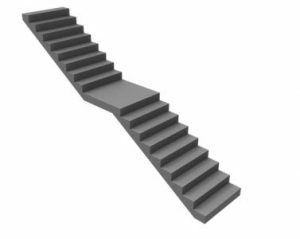 By selecting thinner treads, open risers, and thin metal stringers, straight stairs can be made more transparent than other types of stairs allowing less obstruction to the view beyond. No landing is required if the number of risers is kept under 16 or the overall vertical height is less than 12 feet. 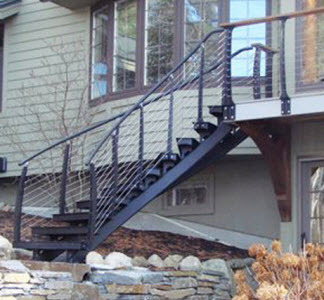 It’s relatively easy to build railings and handrails for straight stairs. Measuring for railings is simpler also. Straight stairs use up a fair amount of linear space which has to be planned for in your design. 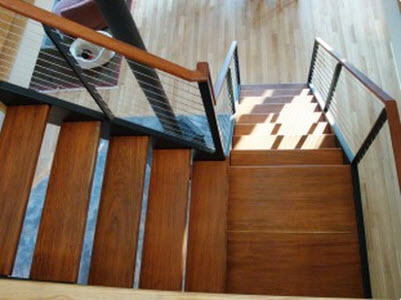 Some of the other stair types create a privacy barrier between the floors of your home. Straight stairs do not offer this privacy. A stair 12 feet high requires a landing to break up the span. The addition of a landing will use up a lot more space and therefore these types of stairs are seldom used in residential construction. You will see these more frequently in large commercial buildings. Straight Stair with a central landing. The L shaped stair is a variation of the straight stair with a bend in some portion of the stair. This bend is usually achieved by adding a landing at the bend transition point. The bend is often 90 degrees, however, it does not have to be. If the landing is closer to the top or bottom of the stairs it is sometimes referred to as a long L stair. L Stairs can be more visually interesting. They provide a visual barrier between floors so they can add some privacy. 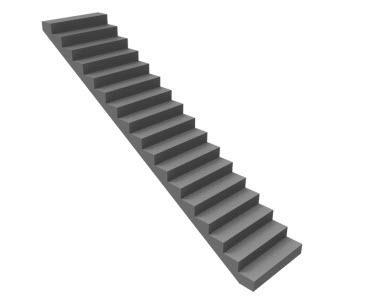 Also, L Stairs can help somewhat with sound transmission between floors if the stairs are contained within walls. Some believe they are safer than straight stairs as the central landing reduces the number of treads one could fall in a given flight. The landing can provide a place to stop and rest while ascending. They can be located in a corner of a room if this works better for your design. L shaped stairs are a bit more difficult to build. A support is typically required for the landing in an L type stair. Often this is built into the surrounding walls so it goes unnoticed. In modern dwellings, however, it is usually desirable to open up the space leaving the stair structure visible. In these cases, the supporting structure can be visually minimized by taking advantage of the strength of steel to create slim supporting members. Through careful engineering, it is possible to eliminate the landing support altogether. Handrails for these types of stairs require more skill and planning to construct. In climates where basements are used, stairs are typically stacked over each other for efficient use of space. Since basements are often used for storage, large items can be difficult to move in and out of the basement. U Shaped stairs are basically 2 parallel flights of straight stairs joined by a landing that requires a 180-degree turn in the walk line. If a third flight is inserted into the middle of the stairs, it would become a double L stair (or quarter landing). U shaped stairs can be easier to fit into an architectural plan. They offer some architectural interest. The landing(s) can offer a resting point part way up the stairs. These types of stairs are a bit more difficult to build. 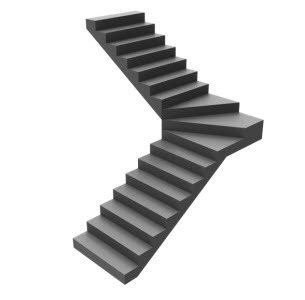 Winder stairs are a variation of an L shaped stair but instead of a flat landing, they have pie shaped or triangular steps at the corner transition. The main advantage of winder stairs is that they require less space than many other types of stairs. They are very common in older homes, often used as a secondary staircase where the grand staircase may have been in the entry and the winder used as an access to the kitchen. They have more visual interest. Winder stairs seem to create a more seamless transition, visually, as they meander around corners. For this reason, they have gained popularity in modern homes. Their compactness has also made them attractive in sustainable home designs. Winder stairs are a little harder to navigate than L stairs. 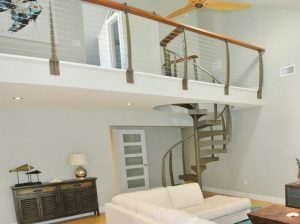 It can be more difficult to add a handrail to these than some of the other types of stairs. 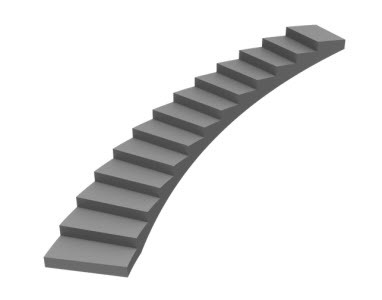 Like with L shaped stairs, a center support is typically required. Spiral stairs are often confused with curved stairs. Although both types of stairs follow a helical arc (like the shape of a spring), spiral stairs usually are made very compact and the treads radiate around a center pole. One of the key advantages of spiral stairs is their compactness. They are very popular on beach front decks where space is at a premium. They are also used extensively on city lofts for the same reason. 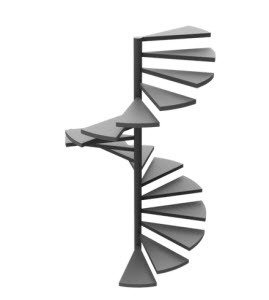 Spiral stairs can be attractive and there are many variations on railings styles which can have a major impact on the overall appearance of the stair. Since the center pole and landing typically provide the structural support for the stairs, they do not need much in the way of extra support structures making installation easier than many other types of stairs. Spiral stairs are more difficult to navigate than other types of stairs. It is for this reason that codes do not allow them to be used as the primary access to a full second floor of a home. Walkability improves as the outside diameter gets larger so if you have space, you may want to consider going a bit larger. We recommend going 5 feet in diameter if you can. It is difficult to carry large items up spiral stairs. Only one person can go up or down the stairs at the same time. Curved stairs add elegance to home or business. For this reason, they are almost always located at the entry where it makes the best first impression. Curved stairs, like spiral stairs, are helical. However, they tend to be on a much larger radius and typically do not make a full circle. Curved staircases are often very elegant and traditional but this type of design can equally be adapted to contemporary designs. They are relatively easy to walk up (if the radius is large). Curved stairs are by far the most difficult to build of the various types of stairs. In fact, building curved stairs represents a pinnacle of achievement for any stair builder or fabricator. For this reason, they are the most costly to build. Since the definition of a stair is a series of steps leading from one floor to another, we would be remiss if we did not include ladders. Library ladders or loft ladders are becoming more popular to conserve space in smaller, sustainable designs. The most compact way to get from one floor to another. Very cost effective due to their simple design. May have wheels or fold up to move them out of the way when not in use or to prevent access. Can be used to access shelves that would be too high to reach normally. Ladders are the most difficult to climb, especially while descending. Can not be used as a primary staircase.